The challenge of designing writing assignments can be particularly daunting. For a writing assignment to be authentic, the task would ask students to (a) construct knowledge in contrast to simply reproducing knowledge; (b) elaborate their writing by making generalizations and supporting them with examples, details, or reasons; and (c) connect their work to issues and concerns that prevail beyond the school’s walls. Research shows that teachers who give students assignments requiring authentic intellectual work see greater gains on standardized tests (Newmann, Bryk, and Nagaoka 2001). The goal of the Writing Assignment Framework and Overview project is to serve as a classroom and professional development tool—born of research and practice—that will help teachers create and refine challenging assignments for students. 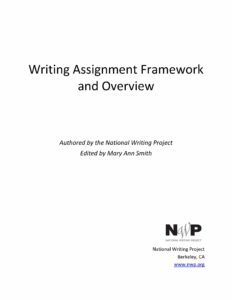 The Writing Assignment Framework and Overview represent the effort of National Writing Project teachers to create tools for themselves and their colleagues that might substantially strengthen their writing assignments. This resource includes: a framework for asking reflective questions about assignments, a sample one-day professional development schedule, examples of assignments and related student work, considerations for how to review sample assignments and student work, and recommended resources.